2017 has been another explosive year for the airframe that seems to not want to become extinct. Driven mainly by low fuel prices and great cargo economics, the global fleet of active 767s actually increased by 9 frames in 2017. What to look out for in 2018? > Cargo, cargo, cargo! We started 2017 with 2 cargo conversion facilities (TLV/QPG). We now have 4 (TPE/MEX). I count already 13 ex-passenger 767s sitting at those facilities undertaking conversions. With 25 conversions completed in 2017, expect that number to potentially grow in 2018. > Major pax fleet retirements in 2018 include: BA (final 7 frames), HA (7 of 8 remaining frames) & FM (final 4 frames). Other carriers looking at retirements (timing will depend on demand, fuel prices, maintenance checks) include AA, DL, AC, NO, IG, LA & NH to name a few. Below are the final tables for 2017 activity (subject to final Q4 adjustments). Who is behind "NO" airline code ? I see the irony, At least you answer to my question. "No airline code" is not something Google understand properly. First new bird for FEDEX, N154FE , is out of the paint shop. Nice to see the 767's gaining a new lease of life as a freighter. First retirement of the year... JA609J (Japan Airlines) was retired from service on 05-Jan-18 and is currently being decommissioned @HND. It will then fly to @GYR to join its two sister frames as part of the UPS fleet and become N364UP. This is the third and final frame part of the original agreement. LN 921, Apr-04 delivery to JAL. How many used 767s does UPS have? Do they operate these fleets any different / fewer cycles than their new build fleet? UPS does not currently operate any used 767s. Last year, it entered into a purchase agreement with JAL to purchase 3 passenger frames with the intent of converting them to cargo for its use. Such conversion has still not occurred with the first two frames purchased (N362UP and N363UP) still sitting @GYR since Apr/17 & Oct/17 respectively. Keep in mind these are some of the newest 767s in the JAL fleet, so they may very well hav fewer hours and cycles than some of the UPS fleet. I would anticipate no difference in utilization. EuroAtlantic Airways returned CS-TFT to the lessor, GECAS, but GECAS then turned around and sold the frame to Atlas Air and it's stored as N1619A, likely for Amazon Prime Air (apparently at this stage, any 767-300ER with significant time left is ideal for conversion. I would not be surprised if Atlas Air leases N530LA as well, although every frame it has acquired thus far was purchased from its previous owner for conversion. I could also see Atlas Air seeking to buy VQ-BBI from Dubai Aerospace Enterprise---DAE (it already bought VP-BVH from DAE and it's now N1439A undergoing conversion for Amazon Prime Air). Also, N1381A is now in the database as registered to a special purpose company with Atlas Air's headquarters, indicating that Atlas Air purchased the frame from AerCap; according to FlightAware, the purchase from AerCap was completed in September 2017. As for the Boeing 767, until the Boeing 787-9 freighter is ready, I would be shocked if some other carrier didn't place an order for new-build 767 freighters...right range and not too heavy (current B763ERs are 187t---the oldest ones are 185t), and they have more range than the A330P2F (unless one gets a new-build 242t A330F frame). The other thing I would wonder is: why are lessors so eager to sell B763s to airlines for freighter conversion instead of doing the conversions themselves and then leasing the frames? One other note: N1501P is being scrapped. N173DN, which had been repainted in the new Delta livery but never flew in it over a decade ago, was also broken up last year. CS-TFT currently stored in TLV engineless awaiitng hangar space for heavy check and conversion, N374AA arrived in TLV from ILN on Friday morning to be converted for ATSG, N377AN should follow it on Thursday morning. That makes sense, I did not remember other used 767s in the fleet. Thanks for the info. Did not realize the build of the exJL frames. That makes sense to easily integrate them into the schedules. Thanks. Well, probably a few factors. 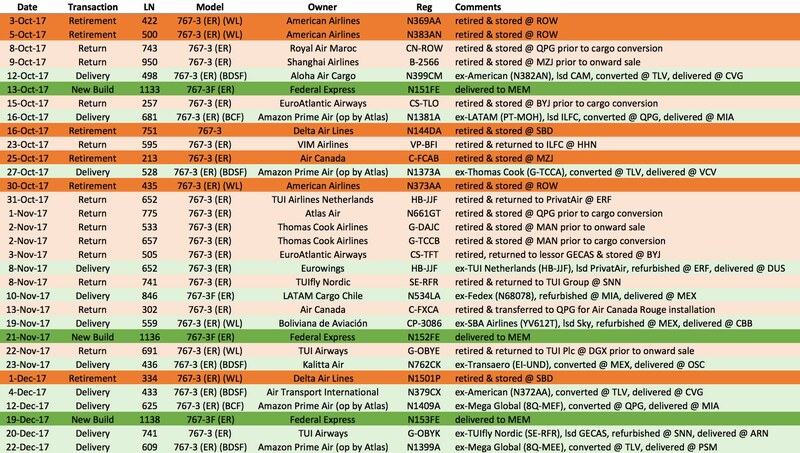 First, to the extent that Amazon is driving 28 freighter conversions in just a couple of years, ATSG and Atlas are contracted to be the dry-lessors, with Amazon as the lessee. Hence, ATSG and Atlas (subsidiaries) want to own the aircraft. Second, managing a cargo conversion requires some level of specialized expertise, and CAM (ATSG) and Titan (Atlas) have expertise in managing the performance of the conversion and associated heavy maintenance, are entitled to special prices, and know how to price the result, as well as knowing how to select aircraft that will do the job. Not saying that a GECAS couldn't do that, but it may not be a business that they are interested in gearing up to do with that level of expertise (i.e. what they do may be more-profitable). Third, to the extent that these companies are converting freighters to place in the general market, it's a somewhat-specialized niche, both as an operator and as a lessor, so the scale, knowledge, marketing, and profile of companies like Titan and CAM make a difference. If you think about it, Euroatlantic had a previously-converted 767-300 just sitting in the desert, and despite the existing market, they didn't have business for it -- either as a dry-lease or a self-operated track charter. So Atlas bought it and painted it white and it's 1709A, which does Atlas work and acts also as a maintenance spare for Amazon. I am sure there are other factors as well, but these are the ones that come to mind. C-FXCA, the 25th and last Rouge 767 has filed from QPG to HND from where it will presumably continue to YYZ. It was in Singapore for conversion, arrived late last year. Anyone knows what happened to ex-Royal Brunei Airlines/Aerosvit B767-300ER fleet that the latter went bust? Four of the ex-Aerosvit 767-300ER are in Ukraine International fleet now. At least one more, in VV livery still, is apparently stored at KBP. I noticed it several months ago, from the top of the car ramp of Terminal D.
Database shows four altogether stored; and at least one of them never served for Royal Brunei. I like this thread, but what I can't figure out here or elsewhere (the flight global statistic is for subribers only) is the actual number of 767 in service end of 2017. I'm especially interested in passenger versions vs. freighter/conversions. A split of -200, -200ER, -300, -300ER would be a bonus. Is there a list somewhere? Wikipedia is not up to date. I don't know about a list, but don't forget to include the 38 -400ERs also, all of which are still flying! First 2 deliveries of 2018 occurred on 1/23. N154FE (Fedex) delivered factory fresh from @PAE to @IND. LN 1140. C-FXCA (Air Canada Rouge) delivered to @YYZ after refurb @QPG. This is the final 763 for Rouge allowed under the current collective bargaining agreement. LN 302. Originally delivered to Canadian Airlines in April 1990 and most recently operated by mother airline, Air Canada. In other news, American Airlines confirmed news reports from last year whereby it is extending the life of its remaining 763ER fleet. The 24 strong fleet is now expected to remain until the next decade and is undergoing heavy maintenance checks and life extension programs. N389AA and N390AA are both @BFM right now. I'm seeing N388AA and N389AA at BFM right now! N390AA hasn't been out of service for quite a while! Has anyone have the count of how many 767-200/200ERs that are still flying today? Both 388 and 389 only have around 90,000 hours on them. With a decent utilization rate of 4000 hours per year, they can easily complete this HMV and get flown to the next c-check. They'd be pretty much done after that. United announced at Investor Day that it will pick up 3 used 767-300ERs to deliver in 2nd half 2018. It is assumed these are the newest 3 of 4 leased HA units that are being pulled form HA service. The 3rd and last ex-TC UK frame, G-DAJC, has been reregistered N1489A and should be flown to a conversion place soon. New Atlas Air bird that will be leased to Amazon Prime Air aswell. American has seen quite a few of their 767-300ERs head off to the desert for certain retirement/scrapping. Upon arrival in the desert, another carrier bought AA's "junk", put it through maintenance and will now fly it for another 20+ years. While cargo is different than passenger operations, this activity has probably made AA stop and scratch their collective chins as to what the true operational lifespan of their 767s is!!! Hey, let's hold onto these birds, turn some wrenches and keep them going. Already bought.....and paid for. Great catch! This will be the 20th and final aircraft that AAWS subsidiaries Titan/Andromeda will dry lease to Amazon Air for operation by Atlas. We now know the whole 40-aircraft dry-lease fleet. 6 CAM 767-200s operated by ABX Air. 6 CAM 767-200s operated by ATI. 8 767-300s converted by CAM and operated by ATI. 12 767-300s converted by Titan/Andromeda and currently operated by Atlas. 1 767-300 converted by Titan/Andromeda and flying but which won't be operated for Amazon for a while. (N1399A). 7 767-300s currently in conversion by Titan/Andromeda (2 at TPE, 1 at QPG, and 4 at TLV). And in addition to the dry-lease fleet, there is 1709A at Atlas, and 255CM and 395CM at ATI, which are maintenance spares owned or leased by those airlines and otherwise used for other things. Yep. I'm not sure that this was AA's thinking, exactly, but CAM certainly has had a surprising run with these old gals. Looks like their sisters will be off the market for a while. There are currently 5 of these ex-AA aircraft at TLV being converted, including two (7375A and 374AA) that went through heavy maintenance at BFM before being sent for conversion. The other 3 went straight from the desert to ILN and then to TLV. Those five are on top of the four ex-AA aircraft that CAM converted and leased to others in the latter part of 2017 (1 to Cargojet, 1 to Amerijet, 2 to Northern/Aloha). There are 4 more recent retirees that I expect to see in TLV in the next few months. After that, we will see whether CAM goes deeper into the AA Desert Fleet, or whether it starts sourcing elsewhere. So that's 13 plus the 3 at Amazon, all retired AA 767-300s. Wow. As I mentioned in another thread, the CAM fleet is pretty-cohesive. For the Amazon dry-leases of 767-300s, it's 3 ex-Qantas and 3 ex-AA plus 2 that started at ANZ then rolled through a bunch of operators. 1) JA8324 (All Nippon Airways) was retired and flown to @SBD on 1/31 for parts-out and scrap. LN 465. Delivered in 1992. Flew its entire career with ANA, most notably as a domestic work horse. Good news is that its likely the only ANA 767 to be retired this calendar year. 2) N594HA (Hawaiian Airlines) was retired and flown to @MZJ on 1/2 for parts-out and scrap. LN 136. Originally delivered in 1986 to Delta as N116DL. This was the 7th oldest passenger 767 still in service and the oldest in service for legacy carriers. That title now passes to C-FCAE still proudly operating for Air Canada. To be fair to American, passenger frames get much more utilization than cargo or charter frames. I’m surprised that AA didn’t arrange for the sales themselves, now that any passenger 767 with significant time or cycles left has increased value with the 767 being to cargo today what the DC-10 and MD-11 have been in years past. Delta is different as they have been flying 767s to near end of validity...some flying have nearly 130,000 hours. Very sad. Thanks for the update as I got to track N594HA's final flight. I got lucky and flew on it in 2016, so it's a special plane for me. Pretty sure that was the oldest U.S.-operated widebody in scheduled passenger service. Quite interesting how much longer it flew than its ex-DL 763A sisters, even though it was the oldest. It outlived every other GE-powered non-ER, and it almost outlived all of the PW-powered ETOPS models still with DL. It was in pretty rough shape inside, but it had a rich history. Sad to see it finally rest for good. I’m surprised that AA didn’t arrange for the sales themselves, now that any passenger 767 with significant time or cycles left has increased value with the 767 being to cargo today what the DC-10 and MD-11 have been in years past. It's not clear that in a few cases they didn't. Jetran bought a bunch of the frames, and it may well be that Jetran had negotiated a package deal, expecting to break them up for parts. Indeed, Jetran owns quite a few still that haven't sold -- and probably will never sell -- as intact aircraft. That said, it does appear possible (I just can't get enough granularity on the paperwork) that American sold a few frames directly to CAM. Remember that quite a few knowledgeable folks on here were mindblown that CAM was buying these AA frames for anything but parts. And yet now these ex-AA 767-300s are the primary feedstock to CAM, who has converted-and-placed 3 with Amazon, converted-and-placed 4 with carriers other than Amazon, has 5 of them currently in conversion at TLV, and has at least 4 lined up to go to TLV when slots open. That's 16 of the ex-AA aircraft making up a substantial portion of CAM's 767-300 dry-lease fleet. But CAM is/was about the only company in the biz that thought it would be a good idea to do this with those frames. And you are absolutely correct that there's a world of difference between flying an out-and-back cargo flight once-a-day and flying 12-14 hours a day for a scheduled airline. That said, during Peak I was pretty-impressed with the hours and number of legs some of the ATI aircraft were doing. Well with the 4 UPS orders today technically the 76 is +2 in terms of frames. So I guess anytime you are in the positive it’s a good day! f the ex-AA aircraft making up a substantial portion of CAM's 767-300 dry-lease fleet. But CAM is/was about the only company in the biz that thought it would be a good idea to do this with those frames. What's the average CAM 763 usage nowadays post-peak? Surely Amazon doesn't have them doing just a CVG-RFD turn and that's it, but is it closer to 6 or 10 total hours? If the latter, that's not *That* far off of normal pax use. The HA 763 that's just been retired at just over 30 years old had just a touch over 90,000 hours (in line with the AA birds in hours, but with FAR higher cycles) so it looks like the CAM machines are utilized in line with HA's schedule, which isn't too shabby. FX is taking delivery of another new 763F today, scheduled to depart PAE at 1230 headed for IND. 1) N364UP (UPS) has left @HND on 2/2 after decommissioning from the JAL fleet. This is the third and last ex-passenger frame under the UPS-JAL agreement. It has joined the other two frames in @GYR prior to cargo conversion. 2) As mentioned above, N155FE (Fedex) has been delivered factory fresh to @IND on 2/2. LN 1141. Second delivery to Fedex this year. 3) N794AX (DHL International) has been delivered to @BAH on 1/31. This frame will be re-registered A9C-??? upon commissioning. LN 115. Most recently flown for ABX Air. Originally delivered to JAL in pax configuration. 1985 build. Leased from CAM. It replaces A9C-DHK which was returned to CAM on 12/21. What's the average CAM 763 usage nowadays post-peak? On ATI/Amazon, you are still regularly-seeing daily shifts of 6-10 hours flying. Not as much on GTI. The Aloha Cargo bird (flown by ATI for now) does a round-trip LAX-HNL 6 days a week. So that's about 10.5 hours x 6 days. Amerijet is getting 3 to 5 hours a day in the air on its newest. But they're aggressively-marketing these days so you will probably see more. Cargojet is getting 3-7 hours, and two-to-four segments on its latest CAM frame. So the Amazon Air assignments on ATI are probably the heaviest hour-and-segment-wise, and the aircraft seem to be handling it, with the others operated perhaps more like typical cargo ACMI. Aloha Cargo is only 2 segments, 6 times per week, but they are substantial segments, of course. While we are a way out from delivery, UPS ordered 4 more 767s. +4 for the 767 fleet eventually. Actually that was already mentioned in reply #35 above! N794AX has had a heck of a career. As of Thanksgiving this past year she only had 58,000 ish hours, but 45,000 cycles. That's one of the higher cycle counts I've seen on an active freighter. Any word on what the recently purchased CAM 767-200 N768VA is up to? Behind a paywall, but one can see the start of the article: SF Express is in negotiations with Boeing to buy four new-build 767 freighters. N794AX (115) is now re-registered as A9C-DHP. A9C-DHK (171) has been returned to CAM as N752AX. Re-registered on 02/14/2018. OY-SRW (Star Air) was delivered 2/2 to @CGN following refurb/painting @AUH/@SNN. Leased from GECAS. LN 960. 2007 build. Originally delivered to JAL Cargo. Most recently operated by LATAM Cargo. Also, both Air Canada and Hawaiian have extended (slightly) the life of their 763 fleets. AC pushed one retirement from 2018 to 2019 and one from 2018 to 2019 (new schedule shows a further 2 retirements in 2018, 5 in 2019 and 1 in 2020). While Hawaiian has pushed out 1 retirement to 2019 (new schedule shows a further 5 retirements in 2018 and 2 in 2019). I suspect that it's a parts frame...although I don't know if CAM owns any JT9D-powered 767s. That was the 13th frame built. I have to wonder if N769VA will be bought for parts as well (its registration expires in May).